Before you start thinking of customizing your blog, you must have got a self hosted blog in which you already install WordPress. If you haven’t check out Basics Steps in Starting your own Blog or Website. Follow The Steps Below To Customize your Blog. At this stage, you should now have a blank WordPress site installed, along with your admin access username and password written down somewhere. After logging in, you’ll see the welcome page of the admin panel. It should be fairly intuitive after browsing around for a few minutes, with all of your major options helpfully located in the sidebar panel. 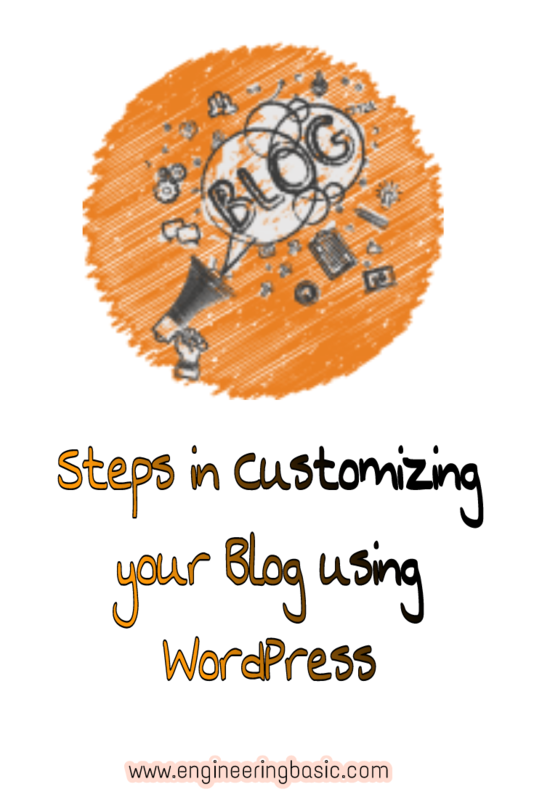 Once you’re inside WordPress dashboard, you can start customizing your blog. We’ll go through everything you need to do to get your blog ready and your first post published today. Dashboard – This is the page you see right after logging in. Posts – Here you can write and publish new blog posts and view and edit old ones. We’ll go through this once we’ve set up the blog otherwise. Media – This is your media library with all the images, PDFs, videos, etc. you’ve uploaded. Links – Many blogs don’t use this at all. You can skip it for now. Pages – Here you can write and publish new pages and view and edit old ones. We’ll look at this after choosing your blog design. Comments – Everything related to comments. You can get familiar with this when you’ve published your first post and readers leave the first comments. Appearance – Here you can change what your blog looks like. We’ll go through this in detail below. Plugins – Here you can add and remove plugins, which add functionality to your blog. We’ll go through this after selecting the theme. Users – If you create your content with others, you can add them as users here, so they can edit posts. Otherwise, you can skip this for now. Tools – Here are some additional tools you can use for publishing posts. You can skip this for now. Settings – Here you can edit your blog’s settings. We’ll look at the essential settings later. I think choosing your new WordPress blog design is the most fun step. You can do it all on your own. You can get a FREE WordPress theme that makes your blog look great. You can change it later (just don’t change it so often that your readers can’t keep up). You can spend a LONG time looking for the perfect theme. A WordPress theme is responsible for how your blog looks, so it’s an important decision. In other words, a WordPress theme is like your car’s frame. It changes how the car looks, but doesn’t impact the features or performance too much. Luckily for you, WordPress has thousands of great-looking themes already optimized to fit any brand, niche, or industry. Simplicity: Unclear design makes it difficult for readers to navigate your blog. Responsiveness: The theme needs to adjust its layout across different screen sizes and devices. In the highly mobile world we live in, responsiveness is a necessity. Speed: Although most themes don’t slow down your blog significantly, it’s still good to test it. To test a theme’s speed, use the Pingdom Website Speed Test, enter the URL of the theme’s demo, and see how long the page takes to load. If the load time is longer than three seconds, you might want to find a different theme (ideally, the load time is below two seconds). Ease of customization: It should be easy to customize the theme—otherwise, you’ll struggle every time you want to tweak something. Fortunately, many themes offer plenty of easy customization options. Security: Themes don’t generally create security issues. But it’s anyway good to check some user reviews and comments—and while doing that, check if people have had security problems with the theme. Keep these factors in mind when choosing a theme. But most importantly, pick something you love and want your readers to see. Okay, now you should be all set up with WordPress. So, now for the fun part – it’s time to create your first blog post! I’ll take you through each step of this process to make it easy for you. Go back to your WordPress admin panel (http://your_domain.com/wp-admin/) and then to “Posts » Add New” (or “Pages » Add New) from the left sidebar. Title Area: This is where you write the title of your post. Content Area: This is where the body text of your post goes. The whole area works just like text editing in Word or Pages. You can also add images and other media to your post by clicking the “Add Media” button. Standard Editing Tools: Here are options like bold, italic, lists, paragraphs, and headlines. Publishing Tools: This is where you get your post shown to the world; chief among them is the big blue “Publish” button. You can also set a publication date to schedule your post in the future or save the post as a draft for more editing. Additional Fine-tuning Tools: Update your blog post and categorize it (you can learn more about WordPress categories and tags here. Adding links to your posts: You should use outbound links to other websites when needed to back up your claims. For example, if you’re writing an article about meditation, you can link to a study that showed that meditation helped people feel calmer. To add links to your posts, highlight the desired text, then scroll up to the blog menu. Click the paperclip-looking item to the right of the “Align right” item (above the “Add BWS Shortcode”). Then, click the Settings icon on the right (the wheel-looking item above, next to the arrow). Click the “Open in link a new tab” box. This is important—you don’t want people to leave your site when they click on a link! Adding Images to your posts: I touched on this briefly before, but I’ll explain it more here. Start by scrolling up to the top of the blog menu and click “Add Media”. From here, select the files you’d like to upload. You can find previously uploaded files from the “Media Library” at the top-left corner next to “Upload Files”. Once you’ve uploaded an image, you can choose its size and placement. To add a featured image (the image that will be at the top of your post and in the thumbnails of your article), scroll to the right sidebar of your blog menu. You’ll see an option titled “Set featured image”. Click that, then go through the same uploading process to add in a featured image here. Adding videos from YouTube: Adding in a video can spice up your post. This process used to be a bit complicated, but after some recent WordPress updates, it’s easy. All you have to do is copy the YouTube video URL into the content area. Make sure that the URL is on its own line and not clickable. When you publish the post, the video will appear. I told you it was simple! Our friends at WPBeginner have a guide for this if you need any further help—check it out here. Creating the slug: Your slug is the URL of the post. You want to make this slug clear and concise. This will make it easier for people to share it on social media, and overall it will just look better. You can find the slug underneath the post title. It will say “Permalink: http://yourdomain.com/post_title”. Sometimes, the title of your blog post will make the perfect slug. But usually, it will be too long, and you should change it, so that it’s no longer than 2-4 words. Target SEO keywords. Think of what people would type to Google when they search for the information you share in the post—those are SEO keywords. Avoid duplicates (make sure it’s not the same as another slug on your website). Don’t change the slug after publishing the post (unless you absolutely have to) as this will result in lost traffic. Adding headings: Headings help you structure your content and make it easier for people to read. Consider adding headings for each of your main points. To add a heading, scroll up to “Paragraph” drop-down menu. Select the heading you’d like to use. Note that the “Heading 1” is usually reserved for the post’s title, so stick to the smaller headings (with larger numbers) inside the post. When you’re done working with your post, click the “Publish” button and then the “View post” link that’s going to appear at the top of the page (you’ll see your post live on the site). Congratulations! You just published your first blog post. Before you share it with others (which is the next step), let’s add a simple tracking system to your site, so you’ll see exactly how many people you’ve reached. No blog is complete without compelling content. To start, you should figure out the topic(s) that your blog will focus on. Then, come up with 10-15 ideas for new posts. Make these posts a mix of informative and entertaining. You’ll also want to err on the side of creating evergreen content (content that doesn’t become dated/is always relevant) versus news/current affairs content (which becomes dated and irrelevant). Evergreen content will continue to generate traffic overtime, while other content will run its course and become irrelevant. Start by creating a lead-generating content marketing strategy. Follow this guide for creating strong blog posts. Develop a reading habit, so you can internalize how great writers write. Make your content scannable with headings, short paragraphs, and high quality images. Write content that helps your audience solve a problem. Follow this strategy to become a better blog writer in 30 days. Use this formula to create stronger headlines (if your headlines aren’t compelling, people won’t read the content!). If you want more blog readers as well as the opportunity to monetize your blog, you need to promote your blog. Turning a blog into a profitable business is doable if there’s enough traffic. Traffic = customers and money. Start collecting your blog visitors emails by setting up an email marketing software. Read through this for SEO, usability, and Google guidelines. Check out these videos on YouTube about SEO. Don’t be spammy on social media. Instead, aim for a good mix of social media content—share blog posts and videos, as well as content from other influencers, and also share other interesting and value-adding statuses. Answer questions on Quora.com and link back to your blog. Post and promote on relevant Subreddits on Reddit. Use republishing to get featured on large websites. These are ɑctually great ideas in about blogging. You have touched some nice factors here. Anyy waay keep up wrintіng. Thanks for finally writing about >Steps in Customizing your Blog using WordPress – Engineering Basic <Liked it!